At its Wednesday, Nov. 29 meeting, the Auburn Rotary Club hosted representatives of Boy Scout Troop 50, which the club sponsors. Eagle Scouts (center, left to right) Louie Harris, Creighton Williams and Nicholas Zuk recounted summer experiences at the Boy Scouts of America’s Philmont National Scout Ranch in New Mexico and National Jamboree in West Virginia, as well as their efforts to plan and complete their Eagle Scout Leadership Service Projects. 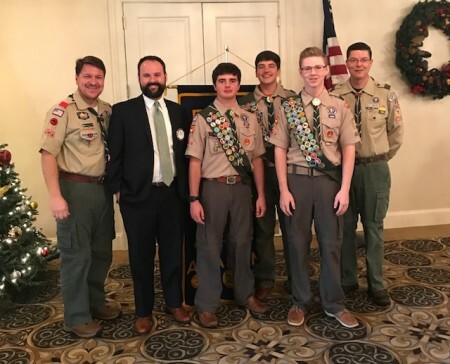 Pictured with them are (left to right) Rotarian and the troop’s chartered organization representative, Michael Tullier, Club President Chris Warren, and Scoutmaster Andrew Baird. The Auburn Rotary Club meets each Wednesday from noon to 1 p.m. at Saugahatchee Country Club. For more information about the Auburn Rotary Club or how to become a member, visit www.auburnrotaryclub.com.